Who doesn’t want a fantastic six pack? It’s one of those marks of a great body that everyone seeks. Unfortunately, it’s also difficult. Fortunately, though, it’s not terribly complicated. Developing your abs is a process that simply requires you to build up your abdominal muscles and then get them to a point where they are actually visible. It can be a long journey to get both elements in place, but it’s worth it once you make it. The first part of the equation is loaded ab work – that means using resistance with your training. The second requires cardio work and a healthy diet. If you can combine the two, you can start along the journey to really embracing ab ripping exercises. 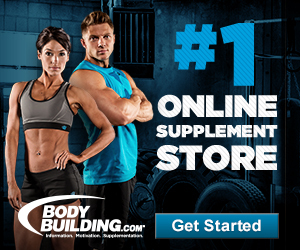 Below are my top 10 ab ripping exercises – exercises that are guaranteed to change the way you look, when coupled with cardio and a good diet. The rollout requires a barbell (usually five or ten pound plates) and a bit of space. 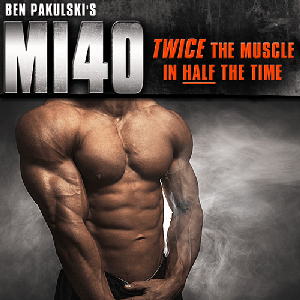 You’ll want to place the barbell in front of you, while you are on your hands and knees. From here, you’ll grip the weight with both hands – make sure they are about shoulder width apart. All you need to do is slowly roll your body forward, ending when you are in a straight position. Pause for a moment, and pull yourself back. It’s a great ab workout and one that more people should embrace. 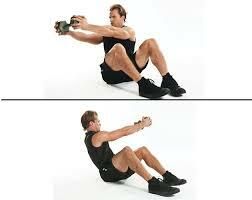 Russian twists are a classic ab exercise, and your goal is to load them up for ten reps per side. All you need to do is hold a weight in each arm, and twist your torso to the side until your arms are parallel with the ground. Once you’ve accomplished this, you move back to your original position and go to the other side. Great ab exercises don’t have to be complicated – they simply have to put your body to work in the right way. 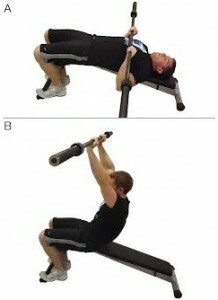 This is another great exercise that really shows you the impact that a bit of resistance can have on an exercise. You probably already know windmills from your days in gym class. This exercise simply adds on kettlebells to help you maximize the efficacy of the workout. 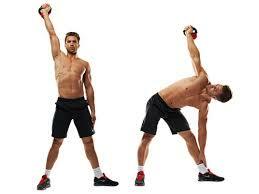 Start by grabbing your kettlebell and press it overhead while you rotate your wrist. You then bend to one side in the classic windmill motion, keeping the kettlebell overhead while you touch the floor with your free hand. Then you move back up to starting position, and go the opposite way. This exercise is simple, but can have amazing results. This exercise requires a simple piece of gym equipment – a high pulley with a rope attachment. It’s a fairly simple exercise, but one that will absolutely shred your abs. Grab the cable, and lower it until your hands are roughly parallel with your face. Flex your waist so that you extend your lower back, and then contract your abs in a “crunching” motion downward. Exhale, and return to starting position. This is an exercise of reps, so try to see how much you can handle. It’s easy to overdo it with cable crunches, but you can also see fantastic results once you learn how to stay within your limits. This exercise looks great, and it certainly makes you feel like a professional. Despite the fact that it’s showy, though, it really does work. 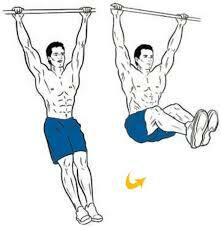 All you need is a chin-up bar – hang from it, and raise your legs up to a ninety degree angle. Drop down, and repeat as necessary. If you really want to push yourself, rotate your torso from side to side when you are in the “up” position – it might be a little harder, but it greatly enhances the rewards. This is basically a variation on the leg raise, but it works a bit differently. You’ll hang in an underhand grip instead of overhand – it might seem like a minor difference, but it really changes how the exercise works. In this position, you’ll be working on a crunch instead of a leg raise – your nose should come parallel with the bar when you’re done. The difference in position helps you to work slightly different areas, and to shock your body a bit in the process. This exercise takes advantage of the exercise ball, a piece of equipment available in most gyms and one that you may have at home. It’s great not only for getting your abs shredded, but it can also help you out with your balance. To perform this exercise, you will start in the push-up position with the exercise ball under your lower shins. 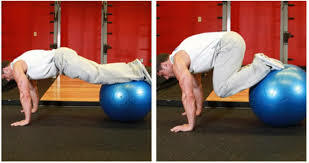 Rather than performing a push-up, you will “pull in” the ball by pulling your knees in to your chest, maintaining the straightness of your back while you complete the maneuver. You then return the ball to its initial position by straightening your legs. The exercise can be a bit tricky at first, but it is a great way to improve your abs and balance at the same time. The side jacknife is another one of those key core workouts that will shred your abs and keep your obliques in perfect condition. It’s probably one of the first workouts you observed at a gym – lie on your left side, with your right leg over the left, and your right hand clasped behind your head. You then bring your torso and leg towards one another, squeezing for a brief second before you return to the starting position. This exercise can be tough on a novice, but it can help you to see massive results. Once you’ve mastered it, you can increase your level of difficulty by strapping on ankle weights for extra resistance. A fairly basic exercise, this is a great way to work on your abs. All you need is a bench and a barbell – so you can easily get this one done at home. Your starting position will be on the bench, with your legs on the extension of the bench and a barbell resting on your chest. The exercise is a simple sit-up – inhale while tightening your abdominals and glutes, and then press the barbell overhead while you exhale. When you lower yourself back down the starting position, you can bring the barbell back down. Simple, effective, and easy enough for anyone to perform. The plank is one of those key core exercises that is easy to overlook, but really should be a major part of your workout routine. There are several variations on the plank, each of which can help you to enhance your gains. The plank is a very simple exercise – just hold yourself up in a prone position with your elbows. There’s nothing special about it, and you simply hold yourself for as long as possible. Once you’ve mastered the basic version, you can try the side plank (holding yourself up with one elbow) or even the loaded side plank (the same as before, but while holding a barbell). There you have it, my top 10 ab exercises for killer abs. Please share if this post was useful to you!